Impostor Khwaja Hasan comes to Alibaba's party, but won't eat their salt. Khwaja Hasan had brought with him a concealed dagger. He planned on killing Alibaba tonight, as soon as there was a chance of doing it with certainty. He was sure that with the element of surprise in his favor, Qasim's son would be too stunned to intervene in time, and if he did, he would be killed too. Ali Baba came to the door himself to receive Hassan. He thanked him for his friendship and for having taken his nephew under his wing. 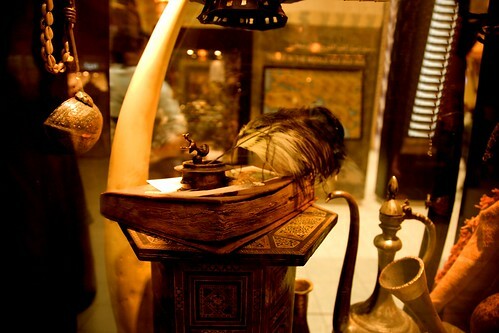 For any novice, acquaintance with an experienced merchant like Hasan, was a very valuable advantage indeed. "Your nephew has great potential," Hasan laughed and answered. "Allah has granted him with a sharp business mind and wisdom well beyond his years. He will do very well." Ali Baba smiled back at Hassan and cordially invited him inside. Upon entry, Hasan noted the changed ambience of the house from his earlier visit. Well-dressed slaves rushed about, preparing to cook meat and veges on open spits. Delicious aromas wafted into his nose, making his mouth water. Shadows danced suggestively on the walls ahead of them as burning torches swayed gently in the mild breeze. Lamps lit up every nook and cranny inside the house. Rich and soft cushions lined luxurious couches. Sheesha were placed around cleverly so they were always in reach no matter where one sat. Trappings of wealth were clearly visible everywhere. 'Is this a display for my benefit or has he become much bolder in enjoying his loot?' Hasan wondered. Music began as soon as they were seated. Amidst further friendly conversation and laughter, savories were served as starters. "Bismillah ir-Rahman ir-Rahim (بسم الله الرحمن الرحيم)," invoked Ali Baba. "Please begin in the name of God, the most gracious, the most merciful." "I must apologize," Hasan answered. "I will not be able to have any salty food today." "Is something wrong?" asked Ali Baba, really concerned that his guest had perhaps been displeased with something. "I'll have it taken away immediately!" "No, no!" stressed Hasan. "Nothing is wrong with the food. It looks very appealing. It's just me. Late this afternoon, I had seen the doctor for an ailment that has been bothering me recently. He has prescribed a strict no-salt diet for me for a few days, but it was too late to cancel our evening arrangement today." "I hope you will understand and kindly excuse me for not eating any salty delicacies tonight. But I assure you, I am already thoroughly enjoying your hospitality. Please continue, and do not worry about me." "How can that be?" Ali Baba's nephew was confounded. "How can we eat, while our guest can't?" "That is easily fixed," Ali Baba said as he clapped his hands. When Abdullah appeared almost immediately, he instructed him to bring in the fruits, followed soon by wine. Abdullah bowed and disappeared outside the room. "Fortunately," Ali Baba continued as he stood up, "the cooking of meats for main course has not yet begun. Pardon me for a moment as I go and instruct them myself, to not to use any salt while cooking, so there is no mistake." Leaving Hasan in the company of his nephew and the slaves playing music, Ali Baba walked over to where the women were supervising the cooking. He instructed them to cook the remaining dishes without salt. "But why?" Ali Baba's first wife objected. "How are we going to eat the unsalted meats?" "We can sprinkle the salt on top as needed," Ali Baba answered. "Our guest doesn't want his dishes salted." "But how will he be able to eat the unsalted meats?" Ali Baba's second wife queried. "He'll manage," said Ali Baba. "Send in the dessert straight after the main meal." "But he won't be able to enjoy his meal without salt?" his first wife objected again. "What does it matter to you?" Ali Baba was irritated by their questions and wanted to rejoin his guest quickly. "Just do as you are told." As he turned around and walked away testily, Marjina stared at his receding back, marveling greatly at such an order. "Yea, why doesn't he want to eat the salty dishes?" Josh asked, unable to hold his curiosity anymore. This Arabian Nights tale was intriguing. "In Persian culture," Isha answered him, "it was considered wrong to kill a man whose salt you had eaten. When Persians came to India, this value got imbibed in the Indian culture as well." "Why?" Josh was perplexed. "And why would someone want to eat someone else's salt anyway?" "Salt," she answered, "symbolized food. When you eat someone's food, or when someone employs you and pays you, so you can buy your own food, don't you feel grateful to them for that. So killing someone who has done something nice for you is disloyalty to them. Kind of like treachery, isn't it?" "So!" Josh exclaimed with a sudden understanding. "He doesn't want to eat their salt, because if he does, he'll feel bad about killing them." "Yea," she nodded, pleased that he had quickly picked up the connection. "But," he countered, "if salt was only a symbol of food, then salted or unsalted, he is actually eating their food. Now if he kills them after that, isn't it betrayal anyway?" Isha stared back at him, stumped by his argument. She looked helplessly at Rosh.